Columbus Paver Patios is a Unilock Authorized Contractor. 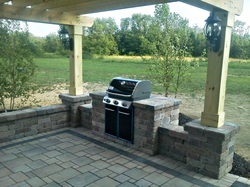 This means we have the skills and experience to handle your Unilock Patio, outdoor fireplace or retaining wall Project. We have completed dozens of Unilock Patio in Columbus Ohio projects and our skills enable us to build not only eye pleasing brick paver patios, but Columbus Ohio patios that will last for years to come. 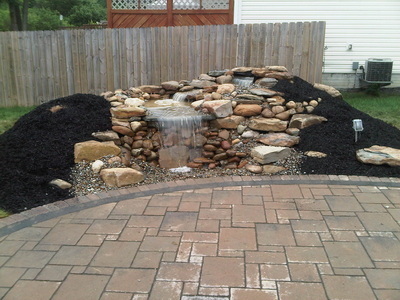 Please explore our online collection of Unilock custom patio projects. Estimates are free and we're happy to work with your plans or develop plans for you. Hiring the right installer is just as vital as choosing the right materials for your project. The quality and durability of your hardscape or landscape project depends on the experience and knowledge of the company or the contractor you hire. To make a truly informed decision as to the choice of your installer, it's very important to ask some key questions, in the hope you will get the right answers and not just lip service. Q1. How many years of knowledge, training and experience does the paver installer have? Q4. Ask the installer if they have any paver or hardscape visualization software programs they demonstrate how the project will look using before and after renderings of your driveway, patio, deck or backyard. Q5. Learn as much as you can about the installation company or individual's reputation, background and history such as how long they've been in business? Q6. Find out if the installation company or individual's state license is active, along with any certifications they posess? Q7. Ask the installer if they are fully insured and bonded and also which insurance provider? Q8. What type of guarantee is the installer prepared to offer you as to the quality and service being rendered? Do they offer incentives or discounts for going over their projected timeline? Q9. Insist that they draft a written proposal or contract before the project commences. (Include a detailed description of the project and a time schedule. Q10. Ask if the installer offers a maintenance plan to provide ongoing maintenance and repairs or cleaning, sealing and restoration services over a set period of time. We can Fix your Patio! Have you hired a contractor with poor workmanship? did it yourself? need help to finish a project or don't know where to start? For a fee I can get you pointed in the right direction. 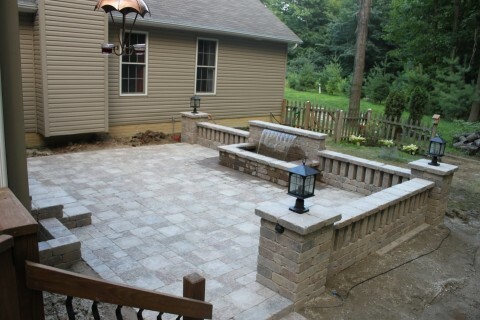 Columbus Ohio Paver Patio Landscape Contractors we work in Medina, Akron, Canton, Columbus and most of Northeast Ohio. We install Unilock paver patios, paver driveways, paver walkways, outdoor kitchens, fireplaces, pergolas, waterfalls, ponds, decks and retaining walls. We can also develop a custom landscape design and installation, install landscaping , trees, shrubs and lawn irrigation systems. Our Medina, Akron, Canton, Columbus and most of Northeast Ohio clients can be assured our landscaping creations will last for years to come. 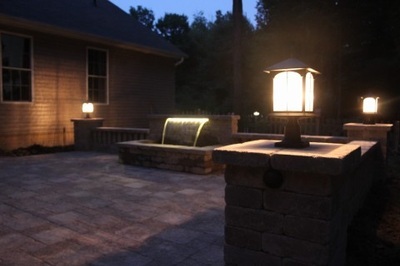 Remember ......if you are looking for a free quote for landscaping, a paver patio, outdoor fireplace, new lawn, hydroseeding in Medina, Akron, Canton or Columbus Ohio please give Columbus Paver Patio a call for all your landscaping projects.